You can capture beautiful photos and videos as far as 197' beneath the surface with your Nikon D500 DSLR camera, thanks to this dedicated Nimar Underwater Housing. It features a moisture alarm that alerts you in the unlikely event of a breach in the waterproof seal. 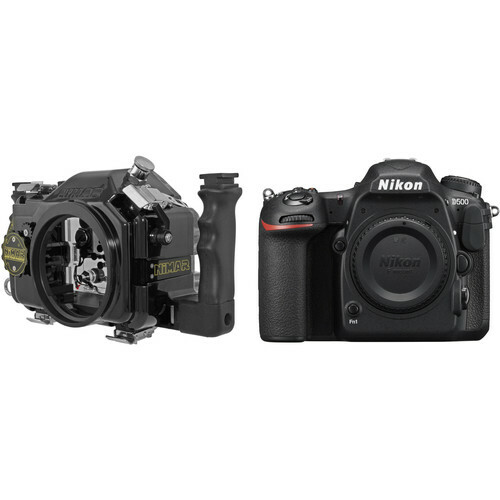 A manual, 5-pin Nikonos bulkhead connector enables the attachment of optional, external strobes via sync cords. Mechanical controls, including push-buttons, dials, and levers, give you access to virtually all camera functions, and an eyepiece with 1.5x magnification offers an enhanced view through the camera's finder. The ergonomic side grips improve balance and handling underwater, while providing T-mounts for optional lighting arms. The enclosure ships without a required lens port, and its bayonet mount accepts optional, interchangeable flat and dome ports for various lenses. For complete compatibility details, check out the list below. Built for durability, the housing is constructed from shock- and corrosion-resistant Bayer Makrolon polycarbonate. It's black on the front, top, and sides, but clear in the back to allow you to monitor the O-ring seal and camera. It also features stainless steel latches with safety clips to ensure a secure closure. Box Dimensions (LxWxH) 11.4 x 11.3 x 8.0"